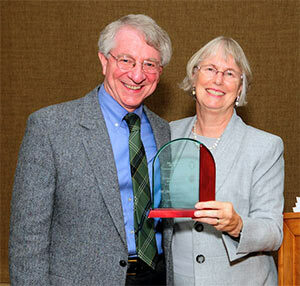 Farley lecturer William Miller, MD, MA, with DFMCH Chair Valerie Gilchrist, MD. The UW Department of Family Medicine and Community Health (DFMCH) proudly welcomed William Miller, MD, MA, as its 2016 Eugene Farley Visiting Professor on September 14, 2016. Dr. Miller’s presentation at the Farley/Frey reception, “Health by Surprise: Refreshing Family Medicine’s Roots,” began with a discussion of health care’s “bifurcation point”: primary care’s shift from many small independent practices to now often being part of larger corporate organizations. He then shared several stories mined from his personal life: challenging experiences that taught him lessons about membership, patience, sailing into the wind, hidden gifts, and even miracles. Later, he discussed studies showing how health and healing occur most often when individuals are enmeshed in a supportive framework of people and places—a healing landscape in which primary care physicians can play an important role. He also provided insights into complexity science, explaining that clinicians, patients and illnesses consist of multiple interdependent factors. Although those factors are non-linear and often unpredictable, he explained, they have tipping points and can be influenced by small changes. “Primary care’s responsibility is to bring complexity science to our work,” he said. Finally, he encouraged family physicians to be part of the next cycle of health care organization, a “third way” that honors seven generalist principles: precaution, weaving, the ancient forest, local geography, sensible scale, swinging awareness and hosting. “Showing up is our power; empathy is our song; story is our way; relationship is our healing,” he concluded. William Miller, MD, MA, is the Leonard Parker Pool chair of family medicine at the Lehigh Valley Health Network in Allentown, Pennsylvania. His team there has developed a clinical department and innovative residency program based on relationship-centered care. Previously, he was the predoctoral education, residency and fellowships director at the University of Connecticut’s family medicine program. He also helped to establish the first group family medicine practice in Bethlehem, Pennsylvania, and was a co-chief resident for the family medicine residency at Harrisburg Hospital, in Harrisburg, Pennsylvania. He has a master’s degree in medical anthropology from Wake Forest University in Winston-Salem, North Carolina, and a medical degree from the University of North Carolina School of Medicine in Chapel Hill, North Carolina. His research interests and publications focus on practice organization and improvement; complexity theory; the ecology of chronic illness care; the family medicine socialization process; healing relationships; and the use of mixed methods, qualitative, and participatory methodologies. The DFMCH also presented this year’s John Frey Writing Award winners. The Frey Writing Awards were established in 2010 to honor John Frey, III, MD, past chair of the DFMCH, and to recognize and encourage individual creative writing.